“Nostalgia on demand,” was the theme of Ben Rowen’s article "The End of Forgetting" in the June 2017 issue of the Atlantic. Not so long ago, nostalgia’s triggers were mostly spontaneous: catching your prom’s slow-dance song on the radio, riffling through photo albums while you were home for the holidays. Today, thanks to our devices, we can experience nostalgia on demand. Rowen highlights that this easy access to memories and past experiences could have negative side effects down the road. Technology has enabled unprecedented access to past memories and experiences in this age of constant documentation. There is also another counter-culture emerging - a nostalgia for analog devices. There is a movement which aims to revert society back to "a simpler time." This movement puts analog technologies on a pedestal, and its proponents would argue that this will free us from our screens and allow us to have a deeper connection with society. Perhaps. But, this nostalgia is selective. We are presented with a false dichotomy: keep your technology and live in a distracted and unconnected society or embrace analog and redeem yourself. I have a different take. Analog tools have their place, and they’re at their best when used in tandem with modern technologies. I first wrote about the analog device movement in 2015. David Sax - author of “Revenge of the Analog” (which is an excellent book) - discusses the success of the famed notebook maker Molskine in a New Yorker article. David digs into journalists’ (and society’s) affinity for paper - specifically how this centuries-old record keeping device is being augmented using mobile apps like Evernote. Moleskine is only one brand among many. Companies such as Field Notes, Leuchtturm 1917, and Rhodia have all enjoyed success in this mobile world. And, there’s good reasons for notebooks to be popular. 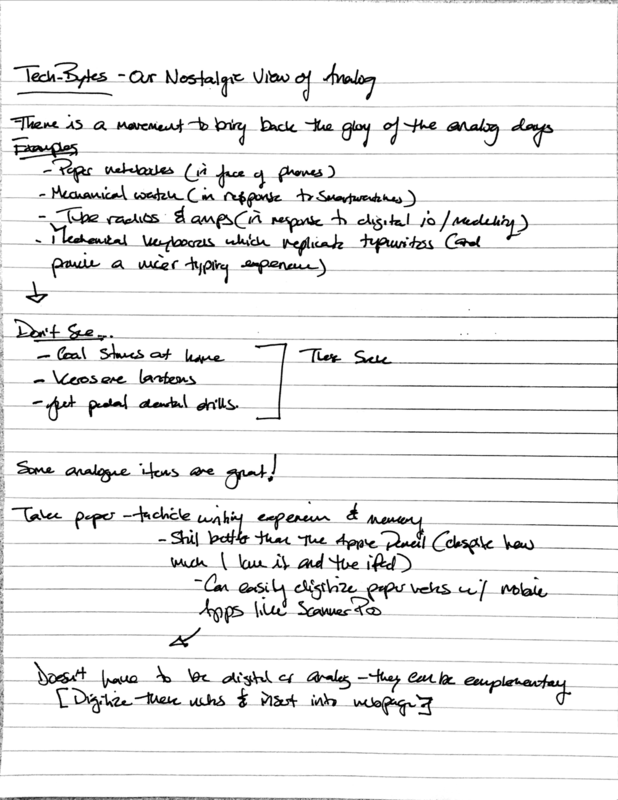 Writing on paper has a satisfying tactile feel that has yet to be replicated by a touchscreen stylus. There's a feedback - a resistance - that nothing can match. Sorry Apple Pencil; I love you, but you’re not a real pencil. There's some evidence that handwriting is tied to academic achievement and memory development. But, modern mobile technologies have made writing even more relevant. There are many scanning apps such as Scanner Pro which will scan your notes into a variety of applications - digitizing paper notes in PDF format. Apple is now adding this feature into its stock Notes app in iOS 11. If you prefer to write with a stylus, iOS 11 uses machine learning to make your terrible handwriting searchable! 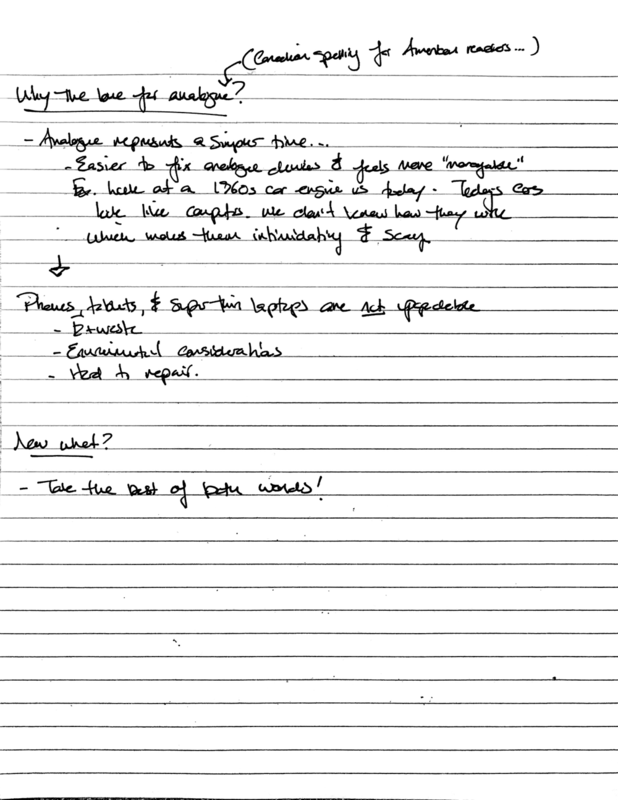 Technology has made it easier than ever to save and archive hand-written notes. The lust for analog goes beyond handwriting. Typewriters have had a comeback in recent years, or at least the feel of typewriters. Mechanical keyboards are a big industry, and not just among gamers. Writers and journalists who want to replicate the feel of these pre-computer devices, or their 80s desktops, can buy mechanical keyboards for relatively cheap. This gives one a loud tactile feedback, with the benefit of modern word processing tools. Music is another area of analog nostalgia, and it's one I can understand. As an electric guitar player, nothing sounds better than a tube amplifier. But with today’s recording software, it’s easy to record right into a computer using a program as simple as Garage Band. In fact, tablets and phones are so powerful that these devices have essentially allowed musicians to carry professional sounding recording studios in their pockets. This growing interest in analog is selective. Typing on a mechanical keyboard is great (for some), but reverting back to an actual typewriter is crazy. Some writers might argue that typewriters offer less distraction. But, many word processors will provide a “focus mode” that keeps you focused on your content. (Also, there are many ways to block notications and social media sites when you need to get work done). While this doesn’t completely replicate the isolation of a typewriter, I think having a backspace key makes the tradeoff worthwhile. IA writer for macOS, iOS, and Android provides an excellent focus mode. I wrote this blog post with it! We can take this argument even future. I haven’t seen any evidence that kerosene lanterns are supplanting light bulbs anytime soon. I don’t see anyone advocating for foot-powered dental drills to make a return. Some analog technologies don’t offer any benefit and that's important to realize. Why do we long for analog? I believe the analog movement is well intentioned. There's a growing “fix it yourself” culture facilitated by websites such as iFixit, which advocate that users should have greater control over the electronics they buy. Greenpeace recently knocked major electronics companies for exacerbating the e-waste epidemic. Repairability is important. Analog also represents a simpler time to some people. It represents a time when you read a physical newspaper and weren’t overwhelmed with an infinite stream of Internet articles. It represents a time when people weren’t bombarded with too many choices. It represents a time before planned obsolescence. It represents a time when people (felt) they had more control over their lives. Compare a car engine from the 1960s and 2017 or a desktop computer from the 1980s to 2017. We know how to use technology, but there’s a fear we’re losing our understanding of how it works. With news of data breaches and cyber attacks, the vast amounts of data being created every day, AI and machine learning taking over, and the increased dependance on cloud storage to backup and preserve all our data, I think people feel like they’ve lost control of their lives. It’s easier to burn a notebook than deleting your digital history. But, there’s a middle ground. We can have our cake and eat it too. I use paper notebooks, use a french press for making coffee, and play guitar through a tube amplifier. I’ve used these tools since I was a kid (well not the french press). The benefits of simplicity are real. But, I really appreciate the ability to easily digitize and save those notes, share Instagram photos of my delicious coffee, and record music I’ve written without a professional audio engineer present. We can learn a lot from past inventions, but those very inventions don’t have to supplant new innovations.